A couple of weeks ago we went to an excellent local trattoria called Nonna Gelsa to celebrate Emma’s birthday. Nonna Gelsa is in the village of Niccone and is run by Chiara and her family. 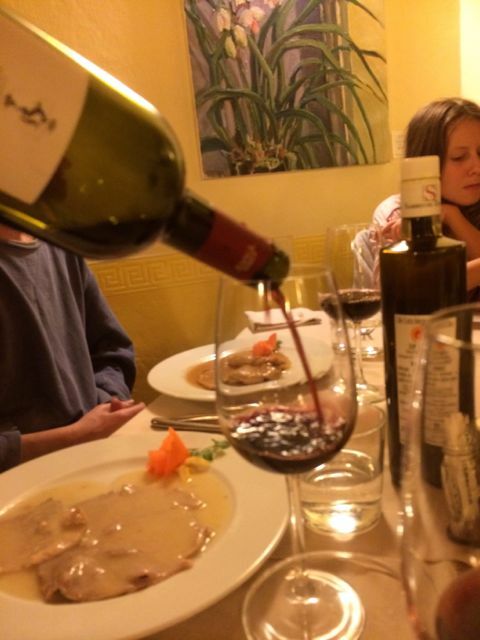 The trattoria specialises in high quality local dishes and has a small but very good wine list chosen by Chiara (house wine is also available by the litre). We shared a couple of large mixed antipasti followed by another course, most of us skipped the pasta and went straight to the secondi, or meat based dishes. We accompanied the meal with a couple of very pleasant bottles of wine from the Umbrian vineyard Conte Faina, I’d never come across this vineyard before but I’d definitely drink these wines again. To finish we ordered a selection of desserts from the wide choice on offer. It was late November when we went and we sat inside near a warm stove, however, if you like to sit outside in the summer Nonna Gelsa has a large garden at the back of the building. Our meal for six cost around €150.